The role of social media engagement in Facebook marketing can no longer be ignored. Likes, shares, and comments are now extremely important to ad performance and Facebook is now taking their Facebook relevance score and overall ad quality much more seriously. Back in 2011, this was not the case. There was no relevance score, Facebook didn’t care about your share-to-like ratio or if people were engaging with your content — but times have changed. This post is going to give examples and teach you how to adapt and benefit from these changes instead of being penalized. Organic and paid marketing on social is only getting harder and more expensive. 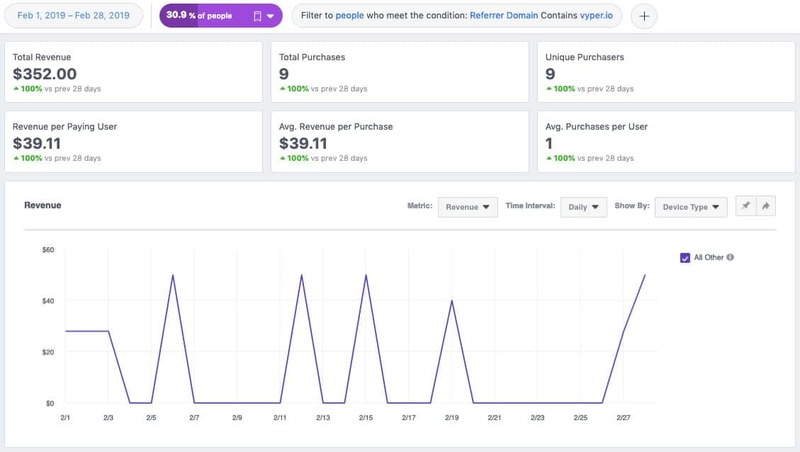 It’s been reported that Facebook’s CPMs (Cost Per Mille — the cost per 1000 impressions) have been increasing by 91% year over year according to AdStage (that’s almost equivalent to Google Ads CPM levels), so you’ll want to start using the tactics below to set up long term marketing strategies that counteract this trend. So, how is the Facebook relevance score calculated? In short, positive feedback increases your Facebook relevance score (for example, clicks, conversions, engagements, video views, etc.) and negative feedback decreases the score (for example, when someone clicks “I don’t want to see this” on your post or low engagement on the post overall and reporting a brand). Here’s an in-depth description from Facebook if you need it. One of the most common reasons your Facebook relevance score drops is because of over-saturation and annoyance to browsers (but I’ll show you how to fix that in a sec). 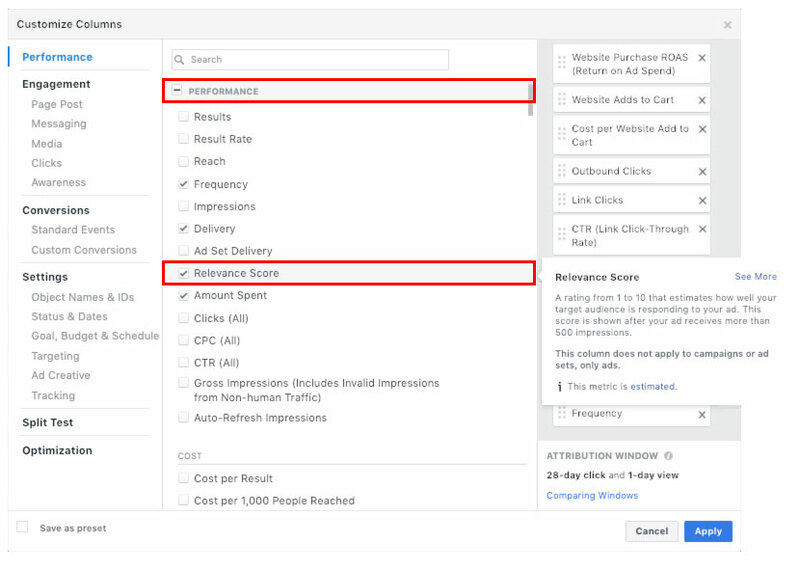 Below is how to add the Facebook relevance score to your Facebook ads dashboard to start monitoring this metric. 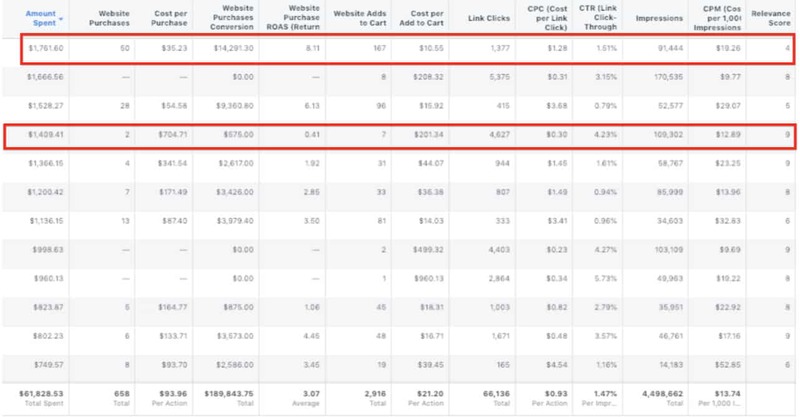 This last point is easy to see in the table below as we broke down the average CTR (Click Through Rate), CPC (Cost per Click) and CPM (cost per 1,000 impressions) by relevance score for an ad account which ran over a $60k test on Facebook. It essentially shows you how much more expensive traffic is on ads with low Facebook relevance scores. You can see that the higher your Facebook relevance score is, the lower your cost (CPC and CPM) of traffic. All of these metrics are heavily affected by the Facebook relevance score. You can see that advertisers that create engaging ads with high Facebook relevance scores are getting incentivized by the ad networks (Facebook/Instagram in this example but it applies to others as well. For example, Google Ads uses a metric called the “Quality Score”). The raw data from that same Facebook ad account tells another story, though. It shows you the importance of balance in your account and using both the top and bottom of funnel campaigns. Just because you have a good Facebook relevance score, does not mean you have a good ROAS. An easy way to visualize how someone moves through the acquisition process is below. On average, it takes someone 4-8 interactions with a brand before committing to a purchase. You will want to have a large audience at the top of the funnel to then show remarketing ads to only the most engaged. The larger the audience at the top of the funnel, the larger the engaged audience at the bottom for you to convert. 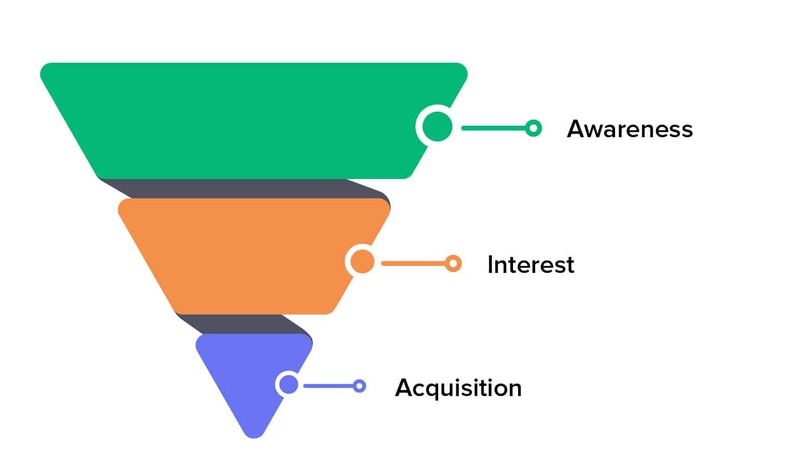 The awareness level of the funnel (the top) is much wider and larger so an extra $0.50 per click will make a big difference in your total ad spend: It can add up to thousands of dollars a day. I’ll show you how to create good prospecting ads below. The messaging to someone who has never heard of your brand before is very different to someone who is getting served a remarketing ad. You want to make sure that the top of the funnel has enough traffic flowing through it to feed the bottom of the funnel “acquisition” — which are the remarketing ads. This is the basic concept of how to scale your Facebook account. The key to success is to have cheap enough traffic at the top of the funnel and high enough converting ads at the bottom. Sounds easy right? Why doesn’t everyone do this? Because there’s a little more that goes into it: You need to balance the top and bottom of the funnel spend. You work this out based on your account’s blended ROAS and CPA (Cost Per Acquisition). Figure out how much you can pay to acquire someone and keep your account under that amount while scaling it. There are a few ways that Facebook reps will tell you over and over again are the basic best practices. Then there’s the way that people like Ezra Firestone, Scott’s Cheap Flights, Tai Lopez, and Tim Ferris use. It includes incentivization and gamification which is much more scalable than the traditional methods. I’ll share both so you can choose which strategies you want to use, or even use both! All of these strategies will improve your Facebook relevance score as well as the Return On Investment (ROI) for your paid advertising campaigns whether it’s Facebook, Instagram, Google, Twitter, Pinterest, etc. so you should definitely implement them as a best practice. Unfortunately, marketing requires a little more than those 5 points, not to mention it’s also super vague. Even though improving your ads and campaigns using the recommended strategies above will help, it’s slow and everyone is doing it. You need to be the marketer doing something different, something to stand out and rise above the rest. That’s why you’re here, isn’t it? To learn how to get a competitive edge on your marketing strategies. Well, I have some good news for you! 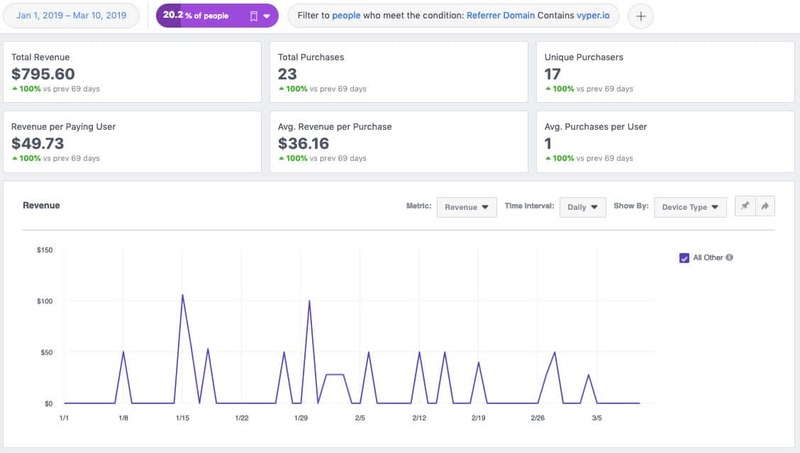 I’m going to introduce you to incentivized, gamified, and referral marketing, which you can use in your Facebook ads to scale and maintain a profitable ROI. I know that sentence sounded like a marketing buzzword extravaganza but that’s the easiest way to describe it before we dive in and I show you. These tactics have all become more popular over time as they start to become easier to implement as marketers get more creative and better marketing tools become available. I know this tend is not as crazy or as fast as the term “fidget spinner” but good things take time. This trend graph plots the popularity of those keywords over time, this is not the most sophisticated way to track marketing trends but it gives a good general trend line for us to understand. Check out Google Trends for your niche to see if it’s trending up or down in Google keyword searches. 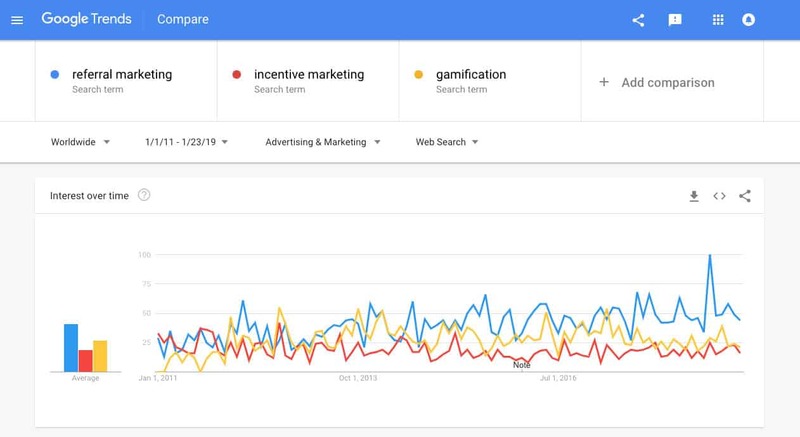 A reason for the slow growth is because it used to be really hard to incorporate gamification and incentivization into your marketing campaigns. Creating incentive or referral systems to get people to complete actions online used to be a custom development job. But now that better marketing tools are available, you can use these advanced tactics much more easily. You don’t even have to have a development or marketing background. In the Facebook account example I shared above we were using referrals, incentivization, and gamification to build that top level of the funnel. These are the ads that have a high relevance score which Facebook rewards us by giving us cheaper CPCs and CPMs. This is needed to get your brand and product in front of a lot of people for less money. We did this by using a monthly contest to engage and gamify traffic. Here is an advanced example and a basic example you can interact with to see how it works. Looking at these examples will make the next section much easier to understand. Now, there’s a little more to it than just setting up a contest — that only takes 15-20 minutes — what we’re going to do next is where the “growth hacking” starts and the real profits are made. Coming back to the funnel diagram we showed above, contests help decrease the cost of traffic on the awareness and interest level of the funnel which allows you to scale your accounts profitably. It’s super important to have some sort of viral content at the top of your funnel — we’ve found contests and giveaways to be the best but it can also be done with viral videos or content, quizzes, and free tools. Aim for something that has high shareability, this will make scaling a lot easier. Once you have 1 or 2 good Facebook posts with a lot of engagement from the contest, use those posts as ads across multiple audiences in your ad account. Remember that social validation is key for credibility and scaling! 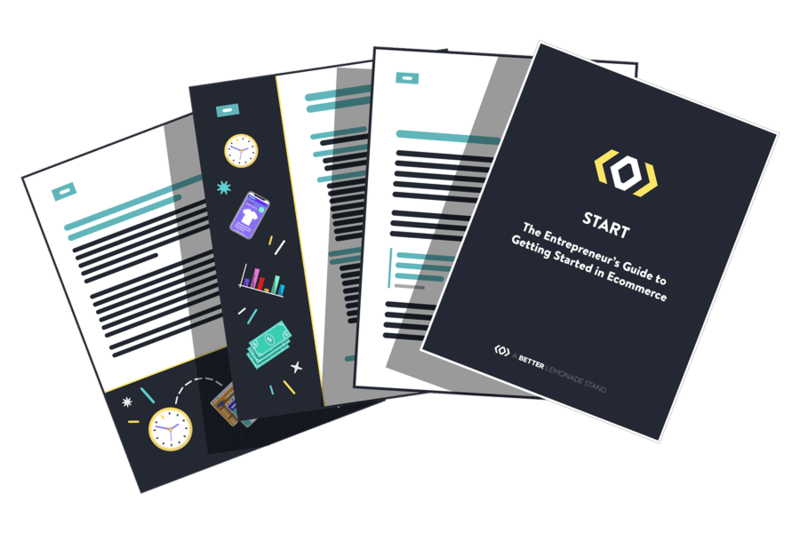 That’s the quick summary — we will dive into exactly how to do these things below. It’s important to focus on the incentive step as we have used this method dozens of times to scale and grow Facebook ad accounts with a 2-5 ROAS. This is not some secret scam tactic that’s going to get you 1000x ROAS in 24 hours. We are looking to set up evergreen marketing campaigns that can run for many months. 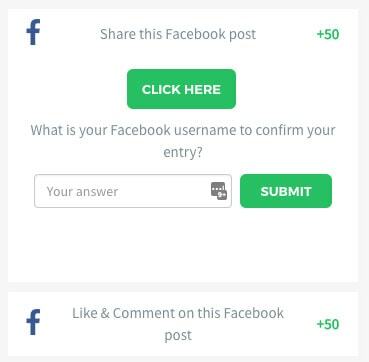 Now that you know that using contests is a great way to build engagement on ad posts, you need to make it super exciting and enticing to sign up, refer others, and complete the other actions you set. From these contest campaigns, we get emails leads, cheap top of funnel traffic, followers, social engagements, and referrals. That’s a lot of give from the entrant so the offer we give them has to be of high value. Using a points system is important as it gives your contest a value. Users can then see that if they complete the actions in the contest they will be rewarded in points which equal prizes such as discounts, special offers, gift cards, and free product. The example contest I linked to above was using scarcity and a sign-up incentive to get huge amounts of people to signup and enter. This is how we increase the CTR and engagement rate on our ads. Once they’re in the contest, the gamification and referrals kick in to scale your contest and Facebook ads. You can also simply use a discount — dollar or percentage. 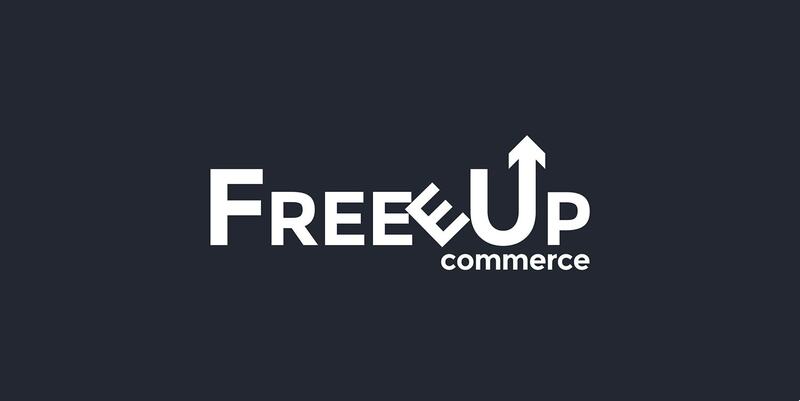 This is the most common option for ecommerce stores as it’s easy to implement. 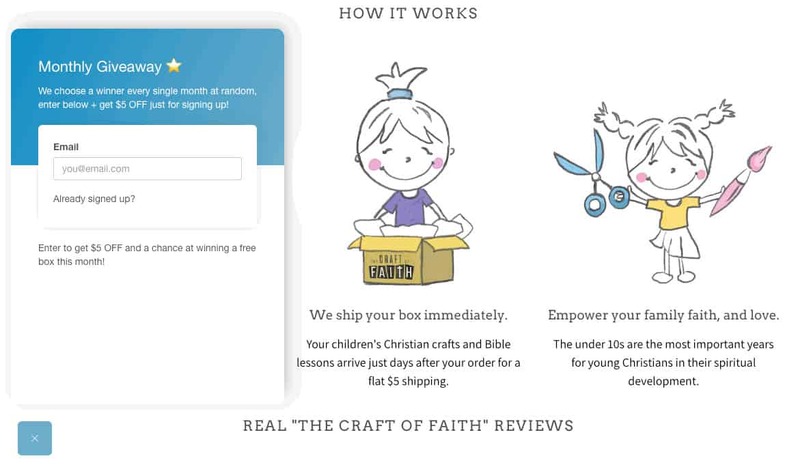 The example below is a subscription box company using a $5 OFF sign up incentive. Mentioning this in your ads, along with all the prizes, will help skyrocket signups and engagement. You can also replace a popup with the website widget, as you see below. So instead of just collecting an email, you also collect followers, social engagements, and referrals depending on what you decide to set your bonus actions to. Now that you know how to incentivize people to sign up to your monthly or weekly contest, what next? You want to incentivize them to start completing those bonus actions that will help grow your brand’s awareness and get your ads shared. The share is so important as it leads to “earned impressions” which is what we talked about above. When someone shares your post, whether it be an ad or an organic post, it gets shown to their audience for free. This is why we want to focus our bonus actions around sharing and tagging. These actions allow us to gamify Facebook engagement to get those 8, 9, and 10 Facebook relevance scores which leads to cheaper top of funnel traffic! By incentivizing these actions, we boost the metrics that improve our Facebook relevance score. Social platforms are looking for content that has a high percentage of clicks, shares, and comments compared to views. Meaning, if I have a post that 100 people see and 40 people engage with, I’m going to get a much better Facebook relevance score than a post that 100 people see but only 10 people engage with. The trick to really scaling to thousands a day in ad spend and increasing sales is in the video below. It will show you the contest posts that drive all the top of funnel traffic and the campaigns that convert all those prospects. Don’t just stop at Facebook and Instagram — now you have their email so remarket to them through an email drip as well! I’ve shown you how to use the “top of funnel contesting” tactic to fill your website and email list with new visitors, leads, and customers but there are more advanced tactics I wanted to share with you as well. 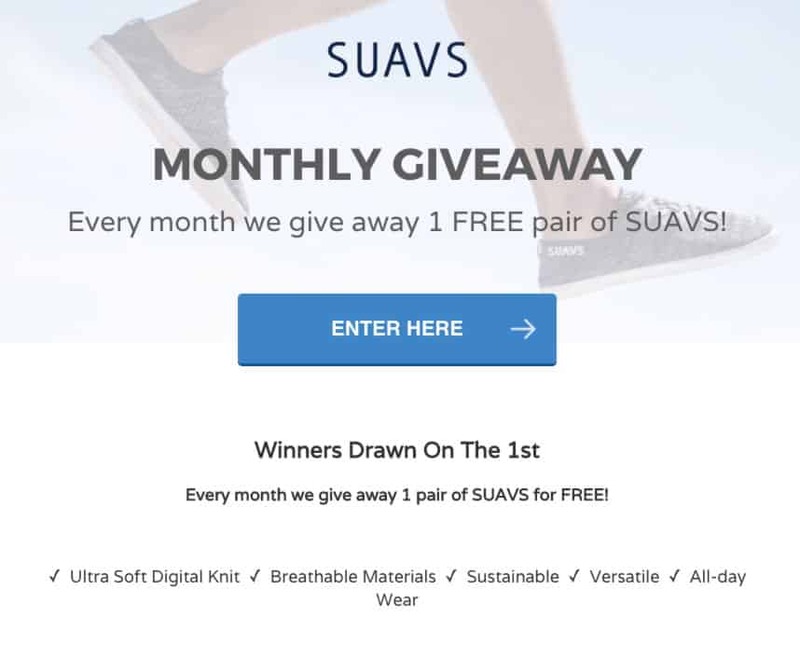 Let’s go over how to use contests to get users to create content for you! This is called User-Generated Content (UGC). UGC makes some of the best converting ads — if you have a happy customer make a video about how to use your product and what they love about it, it will help convince others to also buy. UGC is advantageous because it fits right into social platform newsfeeds and it’s much more organic than a highly produced video. A few other benefits are that it looks less promotional, has a low production cost, and is highly engaging. You can also do this for product or store reviews as well! Once you have your contest up and running you’re going to add a new bonus action to achieve this (take a look at this example). Remember that we are incentivizing people to take actions with points, which are used to redeem rewards or win prizes, so you’ll want to prioritize your most important actions for your business, like how subscribing and liking are prioritized in the image above. 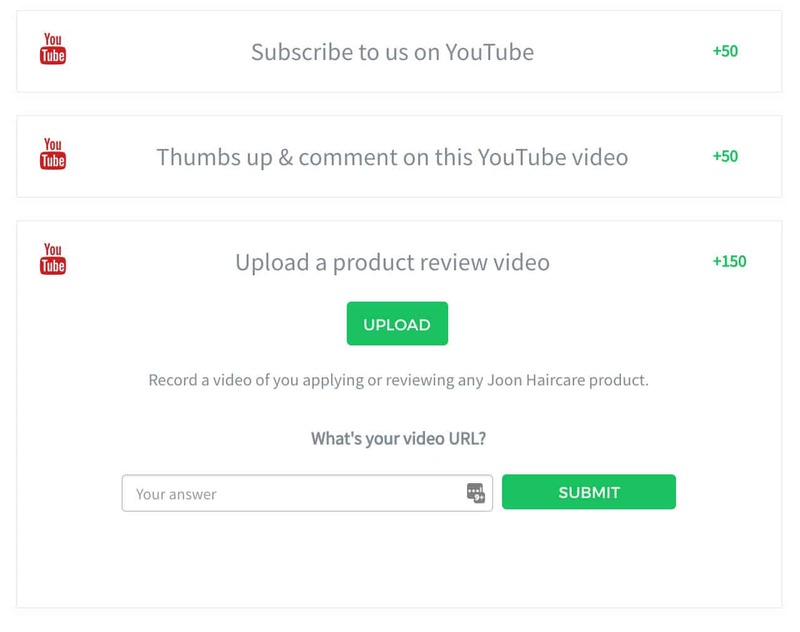 Get entrants to then upload their video review to YouTube or to Dropbox for easy downloadability on your end. There are plenty of sites that let you download YouTube videos, not as many for the other social platforms but you can, however, get an extra social lift if you ask entrants to upload their video to Facebook, LinkedIn, Instagram, etc. Now that you have set up your engagement and traffic machine, you need to monitor and optimize it! Not all traffic is equal and you need to know how to track users and see if those cheap $0.15 contest clicks are actually turning into engaged visitors, fans, and customers. Cheap traffic is great but only if it’s quality, of course. It will not be as high-quality as $6-$10 clicks from LinkedIn or AdWords but that is very hard to make profitable — not to mention one broken link, page slowdown or missed step can cost you a lot of money. Trust me, I’ve done it before. It’s much easier than most people think. A few of the go-to tools are Google Analytics, Facebook Analytics and your email service provider (for example, Klaviyo). The easiest one is Facebook Analytics because if you are at this step you probably already have your Facebook Pixel set up and an ad account, plus this is the easiest channel to run contest ads on. In this case study, we started with a new brand that had no traffic or traction. The first thing we set up was remarketing and then created a monthly contest to build traffic, awareness, and engagement for the brand. You can see in the stats below: 38% of all the website traffic is coming from the contest. When using Facebook Analytics you want to filter by a condition, in this example, we are filtering to people who visited the contest page. The “referring domain” was Vyper.io, where the contest was hosted, as that’s the tool we were using to run the contest. February’s top of the funnel contest generated $352 from direct revenue. This does not include the leads that will convert at a later date through remarketing. If we expand the chart, it shows the total purchases from anyone who visited the contest while it’s been running (around 2 months). You can see even though the contest is a top of the funnel campaign, it’s still generating some direct response revenue ($795.60 in sales over 2 months with a total media spend of $847.63). The reason this does not show up on the ad campaigns is that Facebook, like most platforms, uses a last click conversion attribution. So people are finding the brand through the contest, then converting at a later touch point through remarketing campaigns. So the top of the funnel contest campaign is converting new and past visitors as well as collecting leads and cheap engagement. Remember that a majority of the people entering will be converted once the contest is over or at a later date through email and ad remarketing. The classic example that’s used to explain this is you can’t ask your date to marry you on the first date — the same applies to selling something to someone. The chances of rejection are high if there is no build up. Below is the Facebook spend from the top ads for the contest. You can see that it’s collecting leads at $0.30-$0.40 as well, so if we had the budget to scale and this was not a startup we could 10x this. We only had one product at the time and limited stock so scaling wasn’t viable! Ideally, you’ll want to have a product or two to upsell and cross-sell to make the most of your purchases, however, I encourage you to start with one product — it’s easier to manage and then you can add additional items once you have momentum. This is a direct response only. Over time, these new visitors will turn into customers through remarketing (ads and email) as they reach the 4-8 touch points and feel comfortable converting. Congratulations, we made it! Now you’ve learned how to structure your Facebook account correctly, how to use the top and bottom of the funnel to look at the entire customer journey and not just the short-sighted direct response metrics which most accounts focus on and can’t scale because of. Once you start segmenting your account, scaling will become much more possible. Remember that it also takes monitoring and optimizing your accounts blended CPA and ROAS to maintain a healthy, sustainable growth. In order to get cheap enough top of the funnel traffic, you need to run something like a contest to get your Facebook relevance score, engagement, and CTR high enough. You can use this type of marketing tactic for one-off contests or evergreen campaigns. Once it’s set up, you’ll have a nice system bringing in new prospecting/cold traffic, warming them up, and then converting them. This is a much more sustainable structure than the direct response model of “cold audience straight to conversion” which is working less and less, year after year, as the digital advertising landscape changes. By using a contesting platform, you can also reap extra benefits like incentivized sharing and gamified referrals. Not to mention the added bonus action of getting customers and advocates to create and share user-generated content. Once you start getting more creative with your marketing strategies, you’ll find that paid advertising isn’t nearly as scary as it seems. Good luck! 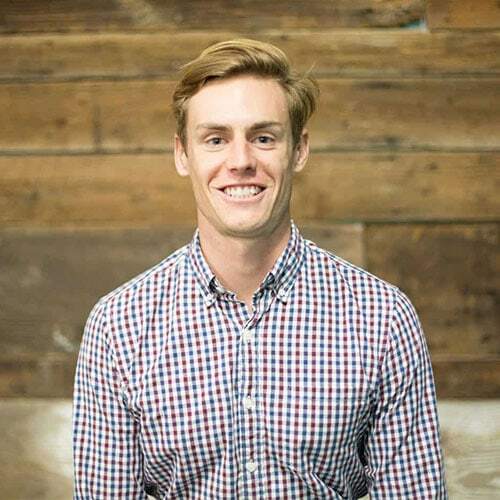 Jack Paxton founded a Facebook ad agency ($150+ million spend in 7yrs with clients like AppSumo, MyIntent & more) then started VYPER, a marketing tool that allows users to run viral contests and reward programs.